Grids have been around now for several years as one of the most versatile merchandising presentation systems available on the market. 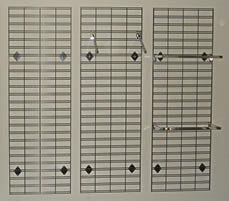 Grid Mesh are constructed from 6mm wire. Grid Mesh is 150mm between the vertical wires and has an additional horizontal wire every 75mm to allow it to take all a variety of fittings. A durable and cost effective way of displaying products. The Grid Panels can be mounted to a flat surface, screwed together or can be freestanding, optional legs are also available. The panels are available in Black, White and Chrome and 99% of Grooved Wall products also fit Grid Mesh Wall. 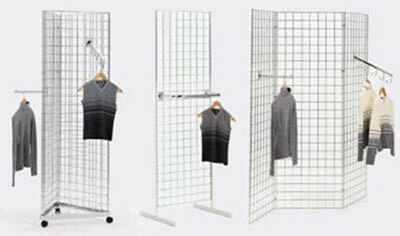 Don't forget to check out our range of Grid Mesh Accessories.